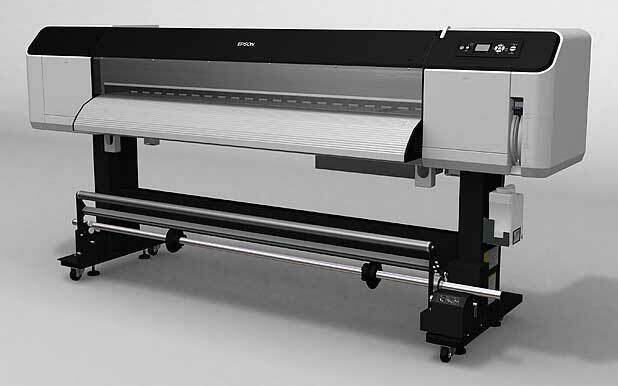 Information we’ve collected on Epson’s new extra wide format Stylus GS6000 (64″) printer. 2008 May 29th The 7900 and 9900 will have X-Rite spectrophotometers in them. “Epson is launching a large-format printer aimed at copy-shops, sign shops and printers who want to print high-quality posters for both indoor and outdoor applications. The Stylus Pro GS6000, which will make its European market debut at FESPA Digital in early April before appearing in the the UK at Sign later in the month, is a 64in large-format printer with an eight-colour set of inks. Epson claims that this gives it the widest colour range to date in a printer aimed at both indoor and outdoor applications; and that its ability to print at high resolution will enable copy and sign shops to move into more premium services, such as exhibition graphics, point-of-sale printing, marketing, photo applications and fine art reproduction. Integral to the Stylus Pro GS6000’s capabilities is Epson’s newly developed UltraChrome GS eight-colour ink set, comprising cyan, magenta, yellow, black, light cyan, light magenta, orange and green. Available in 950ml cartridges, the colour palette is suitable for branded applications. Epson said that the environmental credentials of the eco-solvent type ink set mean that it will not spread harmful volatile organic compounds and is the first major solvent ink set to be launched without the need for a hazard symbol. The machine can attain printing resolutions of up to 1440 x 440dpi and has a smallest droplet sized of 3.7 picolitres. It prints at speeds of up to 25 square metres per hour using Epson’s Variable-sized, Ink Droplet and MicroWeave half-toning technologies. It delivers fast-drying, scratch-resistant prints that are water and UV resistant for up to one-and-a-half years without lamination. The standard machine comes with Giga-Ethernet and USB2.0, allowing high-speed connectivity. Options include support for heavy rolls of up to 30kg and an auto-take-up reel. Epson is making a breakthrough entry into the global sign and display market with the launch of a 64 inch eight colour photo quality printer and UltraChrome GS, an all new ground breaking solvent based ink. The Epson Stylus Pro GS6000 is Epson’s first solvent inkjet printer and is designed to be the most operator friendly and highest quality solvent based printer for the sign and display market. Epson’s Business Solutions Manager, Craig Heckenberg, said the Stylus Pro GS6000 and Epson UltraChrome GS ink makes a strong statement about Epson’s intention to set new quality and performance standards for the sign and display market. “Epson has an enviable reputation for quality and reliability in the large format graphics market. We are now combining our latest print technologies with over 15 years experience to significantly raise the bar in the sign and display market,” Mr Heckenberg said. “Epson’s chemical engineers have developed a truly remarkable ink in UltraChrome GS that is easy to work with, has a much lower environmental impact than other solvent inks, and yet delivers true photo quality images with an extremely wide colour gamut on virtually any coated or non-coated media. “The Stylus Pro GS6000 represents the latest in durable graphics print technology, making it a very efficient and highly capable addition to any print or sign shop looking for that high quality competitive edge,” Mr Heckenberg said. Epson’s new generation UltraChrome GS eight colour ink set uses a uniquely formulated solvent ink chemistry developed by Seiko Epson chemical engineers. UltraChrome GS solvent ink is nickel-free and has fewer harmful VOC (volatile organic compounds) than other solvent based inks. Prints made with this revolutionary solvent ink are virtually odourless, eliminating the need for expensive ventilation and air purification systems to protect the operators. UltraChrome GS maintains Epson’s unrivalled reputation for outstanding colour reproduction and high print quality. Superior colour accuracy is made possible by the addition of orange and green inks which significantly expand the gamut beyond the colour range of both 4 and 6 colour ink sets. Important corporate colours and ultra-vibrant images not previously seen from a solvent based printer can now be reproduced with UltraChrome GS ink. The Stylus Pro GS6000 is equipped with a newly developed Dual-Array Micro-Piezo print head with 360 nozzles per colour for extremely fast print speeds producing variable sized ink droplets between 3.7 and 20 picolitres, depending on speed and quality options selected. Unlike other solvent printers on the market which require daily maintenance, the Epson Stylus Pro GS6000 has been designed to further reduce maintenance down time. The Advanced Cleaning System built into the GS6000 maintains optimum performance of both the ink and print head, reducing the need for daily maintenance when the printer is in constant use. The Stylus Pro GS6000 has high capacity – 950ml – ink cartridges, efficient media handling capabilities, and no special dryers are required for printing. The Stylus Pro GS6000 and Epson UltraChrome GS ink also accommodates a wide range of leading solvent media for a vast array of commercial printing applications, including indoor and outdoor banners, billboards, construction and barricade signs, retail point-of-sale display’s and photographic tradeshow graphics, where high quality images and precise, accurate colour is essential. Up to 25 sqm/hour in banner-quality, draft mode. Up to 15 sqm/hr in everyday production mode. Up to 9 sqm/hour in photo quality, production mode. The Epson Stylus Pro GS6000 will be available from selected authorised Epson professional graphics dealers in October 2008 at a price to be announced. Epson America Inc. has entered the outdoor commercial printing industry with the introduction of the Epson Stylus Pro GS6000, offering technical advancements poised to dramatically impact the professional sign making market. Featuring Epson UltraChrome GS ink, a new solvent-based ink technology with eight individual colours, including an all new orange and green, the Stylus Pro GS6000 produces the industry’s widest colour gamut for unparalleled output quality on nearly any solvent-based media. The printer’s new Dual-Array MicroPiezo AMC print head has been engineered for the demands of high-production solvent printing. 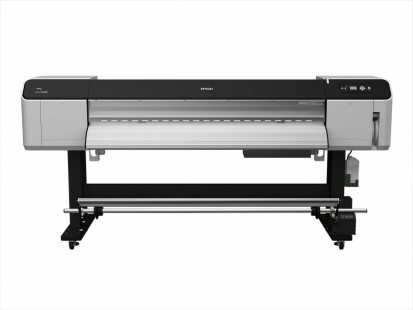 The Stylus Pro GS6000 is also the fastest 64-inch wide roll-to-roll printer in its class, with print speeds of up to 340 sqft per hour for banner-quality printing, up to 180 sqft per hour for everyday production and up to 91 sqft for photographic signage output. “The Epson Stylus Pro GS6000 represents a significant turning point for the solvent-based printing market,” said Reed Hecht, product manager, Epson Professional Imaging. “We worked very closely with the industry for guidance to ensure that it exceeds the needs of today’s commercial outdoor printers. The result is a printer that helps sign makers maximize profits while gaining competitive advantages with superior quality, performance and reliability, with lower impact on the environment and worker health.” Developed exclusively by Epson, UltraChrome GS ink achieves an extremely wide colour gamut, resulting in signs that feature entirely new degrees of colour fidelity and accuracy that are otherwise unattainable with any other solvent technologies on the market. Furthermore, prints from this solution offer superior resistance to scratching and dry extremely fast, eliminating the need for special dryers. The Stylus Pro GS6000 with Epson UltraChrome GS ink also accommodates a wide range of leading solvent media for a vast array of commercial printing applications, including outdoor banners, billboards, automotive and bus wraps, construction and barricade signs, and photographic tradeshow graphics, where high quality images and precise, accurate colour is essential. Epson UltraChrome GS ink is a new generation of solvent-based chemistry that allows commercial sign makers to integrate safer signage printing technology without sacrificing output quality. Unlike competitive solvent technologies, Epson UltraChrome GS delivers virtually odorless printing without the need for special ventilation or air purification systems. In addition, the ink does not contain Nickel (Ni) compounds, minimizing the harmful impact on the environment and employees. The Stylus Pro GS6000 is easy to use and maintain, integrating features that enable sign makers to reduce total cost of ownership for greater profitability. Another new feature introduced in conjunction with this printer and ink technology is myEpsonPrinter.com. This unique Web-based printer information and management system enables commercial printing professionals to monitor print jobs and consumables virtually in real time, including tracking ink and media consumption, managing printers at remote locations, robust reporting, and intelligent support, allowing Stylus Pro GS6000 printer owners to manage their Epson printer investment. Included with every Stylus Pro GS6000 is the ColorBurst Professional Production RIP, an entirely new, full-featured Postscript Language Level 3TM compatible RIP and Print server. In addition to robust layout functionality, the RIP is Pantone licensed for accurate spot colour matching, offers support for ICC output profiles and incorporates a new multi-threaded/multi-processing architecture for extremely fast job processing. The Stylus Pro GS6000 will be available in July 2008 through authorized resellers for $28,995 (MSRP). 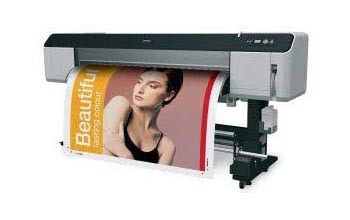 It is supported by a standard Epson Preferred Limited Warranty.